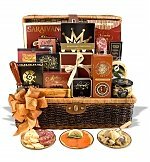 Executive Gift Baskets - It's All About Business! Executive gift baskets. If you've ever wanted to let a vendor, customer, or other business connection know just how much their relationship means to you, executive gift baskets are the way to do it. With a corporate holiday gift basket, you can speak volumes without ever saying a word. Gift baskets make the perfect present for any occasion, including birthdays, events, and holidays. They're also a great "going-away" gift, as well as a way to congratulate someone for a job well-done. 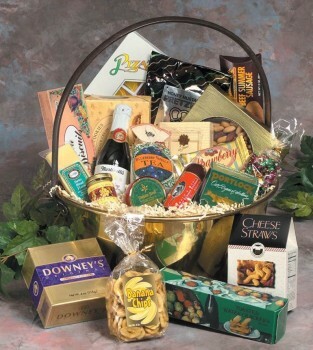 You can even provide these gift baskets to supervisors, other upper management, as well as to your employees. There are obviously a great deal of gift baskets to choose from. 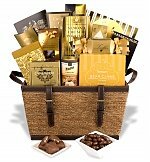 Corporate gift baskets generally include supplies such as cigars, fruits, snacks, books, organic snacks, gourmet coffees and chocolates, nuts, wines, and candy. There are also specially-themed gift baskets to choose from as well. Some of the common themes of a corporate holiday gift basket include fishing, football, golf, gardening, champagne, cocktail, beer, scents and candles, lotions, and cigars. 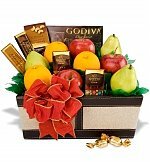 If planning to present your gift basket to an individual, find out what they like. The last thing you want to do is present a golf ball-themed basket to someone who is a huge football fan. Find out a little about their interests by walking by their desk to observe some of their personal items. For example, you might notice that (if female) she has a plethora of scented lotions and a few candles sitting out, along with a small box of chocolates at her side at all times. Another one of your co-workers or employee's may be crazy about snacks and coffee, if so, then a snack and gourmet-themed gift basket is obviously in the works. 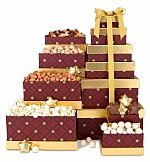 Affordable Corporate Gift Baskets how to impress, yet mind the corporate dollar. Corporate Coffee Gift Basket for those with a passion for java. If presenting executive gift baskets to customers, there may be little-to-no way of knowing what their personal interests are. In that case, it's always best to play it safe, and if they don't like it personally, it's the thought that counts. A gift basket that most everyone will adore will contain samples of fruit, chocolate, nuts, and various other select snacks. You can never go wrong with food. Refrain from choosing anything along the lines of golfing, gardening, football, beer, or alcohol, especially if there is no way of finding out if your customer prefers those items. Fortunately, there are several ways of delivering a corporate holiday gift basket. If ordered online, you can easily have the basket shipped anywhere in the world. Another way to give this gift of excitement and appreciation is to present it at a company party. If you've got the money to spend, you can just as easily order as many executive gift baskets as you would like, presenting each and every customer, employee, and co-worker with a gift they'll never forget. A corporate holiday gift basket presented to a customer will inevitably increase their loyalty with your company, improving the relationship. Obviously, a gift basket takes the guessing game out of gift-giving. You won't have to beat your head against the wall in an attempt to figure out the perfect gift, nor will you have to worry about spending a ton of money.